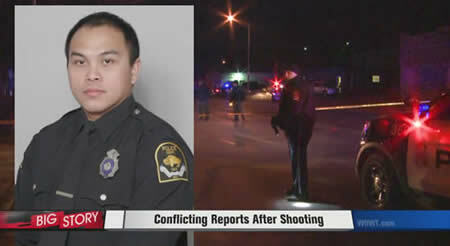 Officer Alvin Lugod has been a police employee of the Omaha (NE) Police Department (on Facebook here) for six years. In that time, he’s killed two people while wearing a police uniform. Jermaine Lucas seemed to be in the wrong place at the wrong time when officer Alvin Lugod and his partner – Joseph Koenig – claimed to have heard gun shots while on patrol September 17, 2012. That lead them to Jermaine who happened to drop a gun out of his pants as the police duo approached him, so they shot and killed him. Of course the officers claim he lunged for the gun but I’d be willing to bet Jermiane was attempting to make a run for it. Jermaine was on a on a two-day furlough to visit with family from the Lincoln Correctional Center. Yes, he was an inmate who was doing time for a violent crime and it was illegal for him to have the gun in the first place, so he was ‘breaking the law.” This is exactly why it makes no sense to me that he’d reach for the gun, doing so has obvious consequences, but running makes perfect sense. Of course, the officers claims of hearing gun shots couldn’t be pinned on Jermaine as the police couldn’t determine if the gun he dropped was recently fired or not. In fact, the two officers are the only ones who witnessed the gun fall from Jermaine’s pants. Let’s state the obvious, this wouldn’t be the first time cops have planted a gun on someone after they shot them. It should also be noted that 31 seconds passed from the time the officers claimed to have heard gunshots to the time their own guns fired shots. Just 31 seconds!